You sometimes use Windows Defender for detecting malware. In order to automate this process, you want to be able to start the required checks with a script. 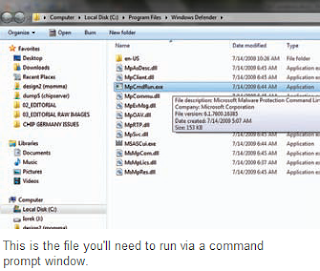 Windows Defender can be directly run using the command like ‘mpcmdrun.exe’. Here, you can give the relevant parameter for several tasks. The tool is located in the ‘Program Files\Windows Defender’ folder on the system. Administrator rights are required for using the tool. Therefore in case of scripts, ensure that you always use the right path for calling up the tool and run the script with administrator rights. The most important commands are ‘mpcmdrun signatureupdate’ for updating the signature lists and ‘mpcmdrun scan 1’ for a quick system check or ‘mpcmdrun scan 2’ for a complete check. You can get information about additional options, especially about work logs, from the command line with ‘mpcmdrun ?’.